We feed two stray cats on our porch. 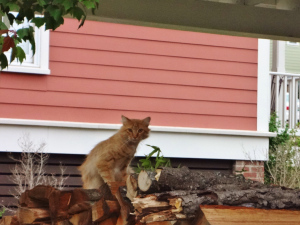 One is a little gray tabby (GT) whom I’ve never been able to photograph, and the other is a gorgeous orange long-haired beauty that we have named “Orange Kitty”. Surely you can come up with something better than that?